Bruce Anstey celebrates after winning the Lightweight 250 race at the Classic TT in 2017. Milenco by Padgetts Honda team boss Clive Padgett says 'Flying Kiwi' Bruce Anstey remains 'very much a part of the team' as he continues his recovery from illness. The popular New Zealander, who will be 50 next month, missed all of last season following a cancer diagnosis, although he did attend the Classic TT last August, when he completed a parade lap on the Padgetts Honda RC213V-S.
New Zealand's Bruce Anstey with Clive Padgett. 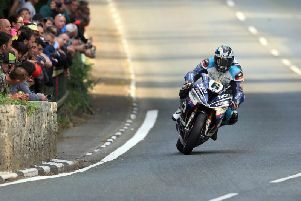 Anstey is a major doubt for North West 200 and Isle of Man TT but Padgett said he hopes the 12-time Mountain Course winner will be in attendance on the island in June. Manxman Conor Cummins will spearhead the Batley-based team's international road racing challenge, while rising star Davey Todd will ride a CBR600RR in the Supersport class alongside his Penz13.com BMW Superbike and Superstock machines. Team boss Padgett said: “As a team we’ve always enjoyed great results in the Supersport class and we have a very strong line up this year. 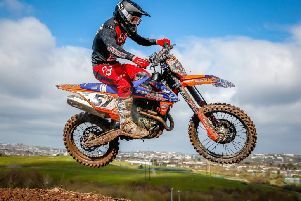 Conor goes from strength to strength and is a contender in every class while Davey Todd is one of the most impressive riders to come through in recent years and hopefully we can help him build on last year. Todd will only be making his second appearance at the TT but the 23-year-old cannot be ruled out after finishing 12th in both Supersport races on his debut last year, when he lapped at 124.364mph on the Burrows Engineering Racing Honda. He will line up at number eight in both Monster Energy Supersport races, while team-mate Cummins will lead the field away from Glencrutchery Road at number one. Todd’s performances at last year’s TT catapulted him into the road racing limelight after he became the second fastest newcomer ever to have lapped the 37.73-mile circuit with a lap of 128.379mph in the Senior. A brilliant ninth place in that race was backed up with 10th in the Superstock race and his stunning debut saw him win the Newcomers Trophy, the TT Privateers Trophy and the RST Star of Tomorrow award. Ramsey man Cummins clinched two podiums in the Superbike and Senior races last year but also shone on the team’s 600, finishing fourth and fifth respectively in the two races and recording a new personal best lap time in the class of 127.268mph.